• There are 225 rooms and suites. • Cipriani restaurant, the Pergula pool restaurant, an American bar, a Barracuda piano bar and an opulent meeting room. • Outdoor pool, a tennis court, a fitness center and a beauty salon. • The Palace faces the Copacabana Beach an the other side of the Avenida Atlantica. • 1919: Aquisition of some real estate on the Avenida Atlantica by Octávio Guinle. • 1920: Building of the Palace with the French architect Joseph Gire inspired by the Hotel Carlton in Cannes. • 1923 August 13: Grand ball for the opening of the Copacabana Palace. Young Aimee de Sa Sottomajor, later Aimee de Heeren and her sister Vera fascinate everybody with their overwhelming beauty. • 1925: Albert Einstein is a guest of the Hotel. • 1931: Edward VIII stays at the Palace. • 1934: Building of the Hotel Swimming Pool. • 1936: Igor Stravinsky and Stefan Zweig stay at the Hotel. • 1941: Walt Disney stays at the Hotel. • 1942: Orson Welles stays at the Hotel. • 1953: A fire destroyed a small part of the Hotel. • 1960: Slow decline after Brasilia replaced Rio as the capital of Brazil. • 1962: Moovie Copacabana Palace with Sylvia Coscia and Franco Fabrizi. • 1975: Princess Soraya of Iran stays at the Copacabana Palace. • 1985: Projects to demolish the iconic Hotel. Gina Lollobrigida stays at the Hotel. • 1986: Prince Johannes von Thurn und Taxis stays at the Hotel. • 1989: José Edouardo Guinle sells the Palace to James Sherwoon from Orient Express Hotels. • 1991: Lady Diana stays at the Palace, also Winnie + Nelson Mandela and Roger Moore. • 1995: Liza Minelli stays at the Hotel. • 1998: Pierre Brosnan and Claudia Schiffer stay at the Hotel. • 1999: Queen Margaret of Denmark stays at tha Hotel. • 2002: Barbara Bush stays at the Hotel. • 2004: Presidente Luis Inácio Lula da Silva stays at tha Hotel. • 2006: Princess Victoria of Sweden stays at the Hotel. • 2007: Al Gore stays at the Hotel. 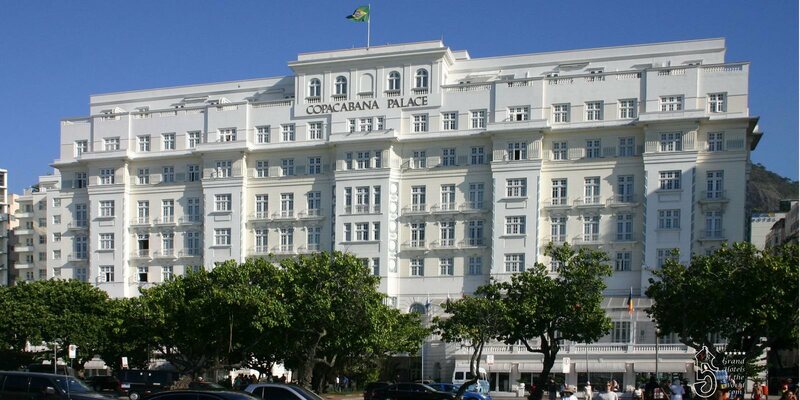 • 2008: The Copacapana Palace becomes a cultural Monument. • 2013: Novel writer Countess Caroline von Krockow Lahame stays at the Hotel. • 2014: Orient Express Hotels rebranded Belmond.